The journey continues on Tuesday, December 18, as we visit another sacred space. 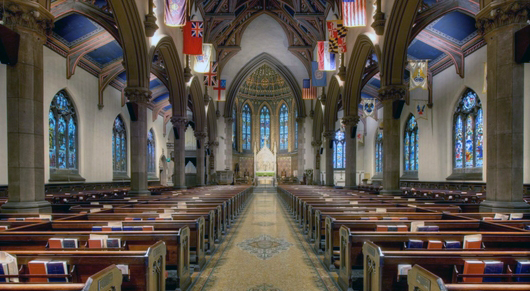 Join Diane Conroy-LaCivita as she travels to St. Peter’s Episcopal Church in downtown Albany. St. Peter’s Episcopal Church has served as an active center of worship for over three hundred years. A member of the Diocese of Albany, St. Peter’s existed before the formation of the Episcopal Church after the American Revolution. The Rev. Thomas Barclay came to Albany in 1704 with his primary ministry directed to the Iroquois tribes and the British garrison. Rev. Barclay soon oversaw the building of the first Anglican church in Albany and the first service was held in this edifice in November of 1716. Two more churches were built subsequently near the site of the original church. The current St. Peter’s Church is the third structure in the parish’s history, the first having been built in 1715. The CSSC shuttle bus will leave The Beltrone Living Center at 9:30 a.m. and return at approximately 11:45 a.m. Don’t miss this opportunity to visit this beautiful historic sacred space. To make a reservation, please call Sharon Herald at 518-459-2857 ext. 302.